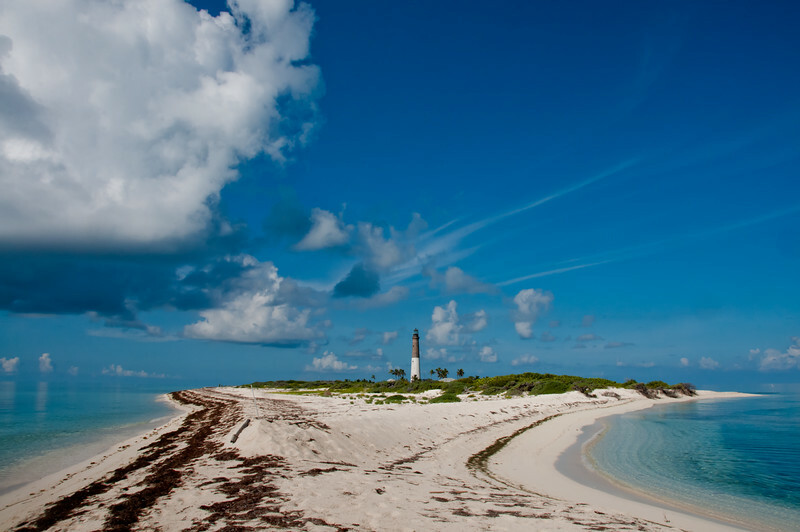 The view of Loggerhead Key from the north end. 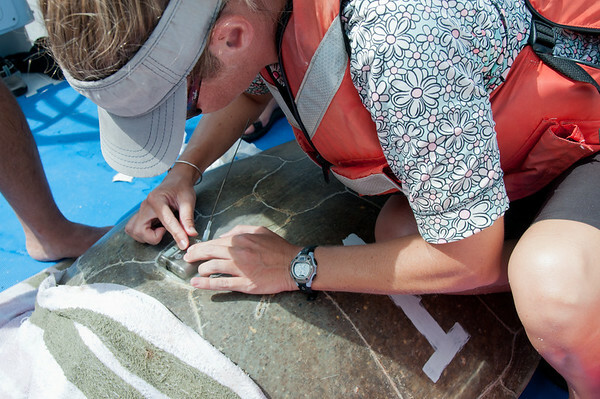 An NPS volunteer marking PVC stakes with colored tape. 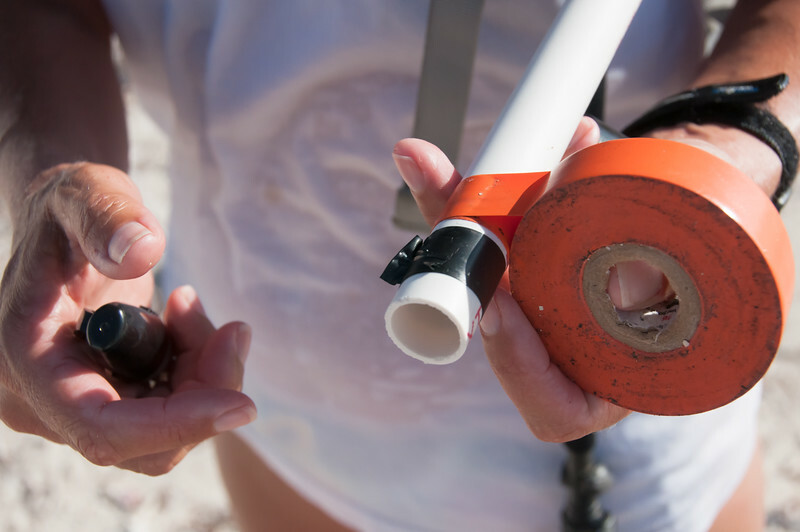 These stakes are placed alongside each nest to mark the date of laying, and help park researchers keep track of when the nests should hatch and if the nests are inundated or washed away by high tides. 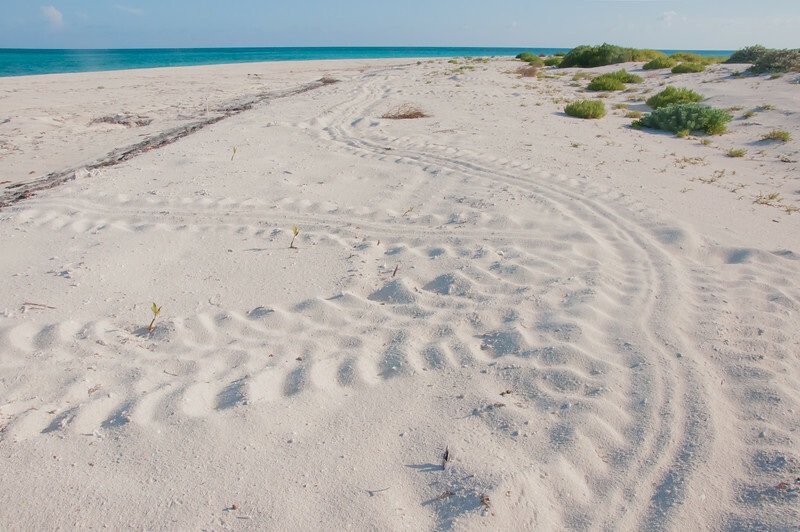 Tracks from a nesting turtle that seemed determined to explore the entire length of the island before deciding where to nest on East Key. 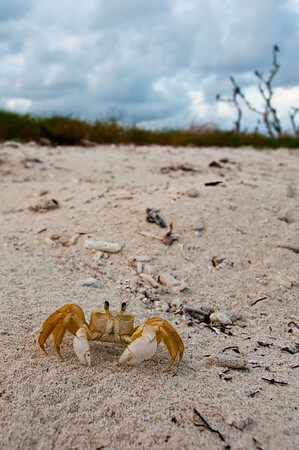 Ghost Crab on Bush Key. 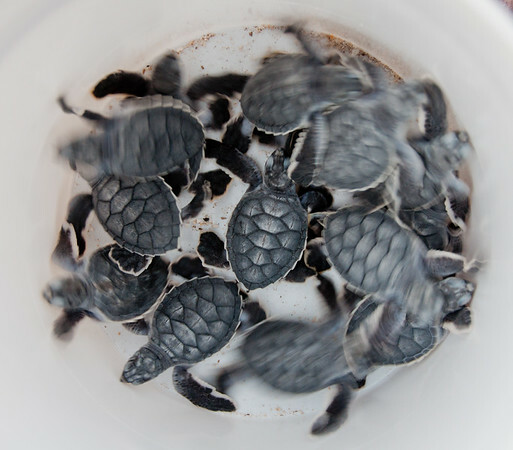 These crabs are voracious predators of turtle hatchlings. 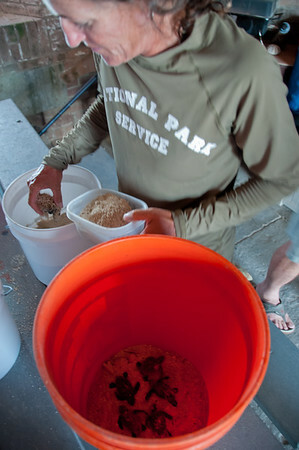 Transferring the recovered hatchlings to a deeper bucket to ensure they don't climb out before they are released off the beach in the evening. 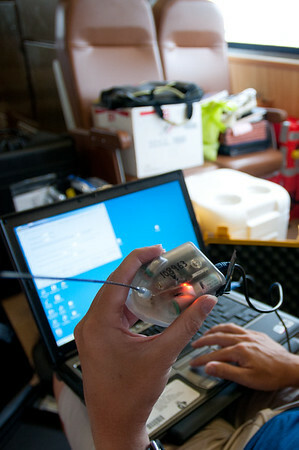 Using a synch chord and a magnet, A USGS biologist activates a satellite tag to be deployed that night. 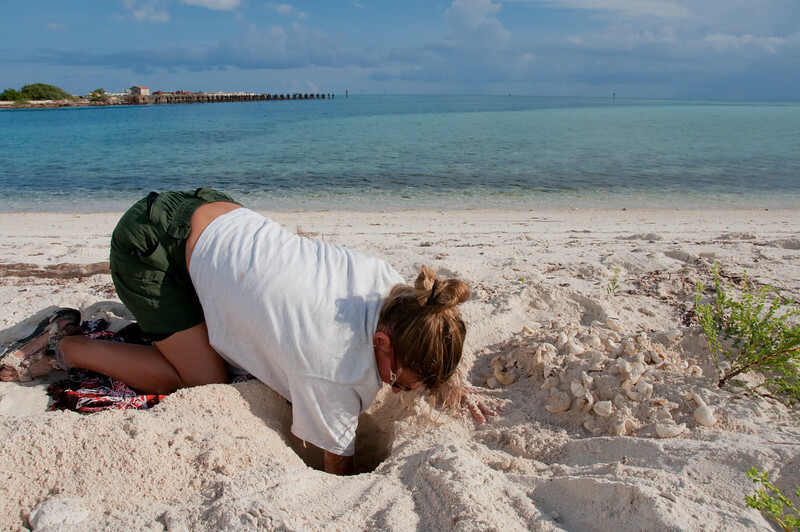 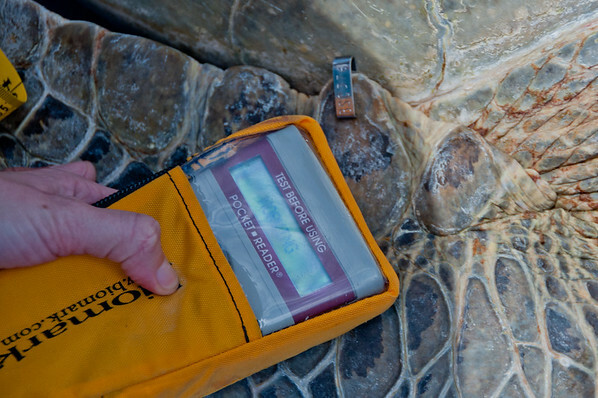 The lead biologist uses a PIT tag scanner to check if the turtle been previously tagged with that method. 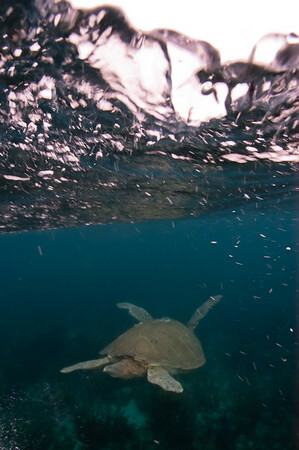 It turned out to be this turtle's first capture, so he was outfitted with flipper tags, a PIT tag, and a satellite tag. 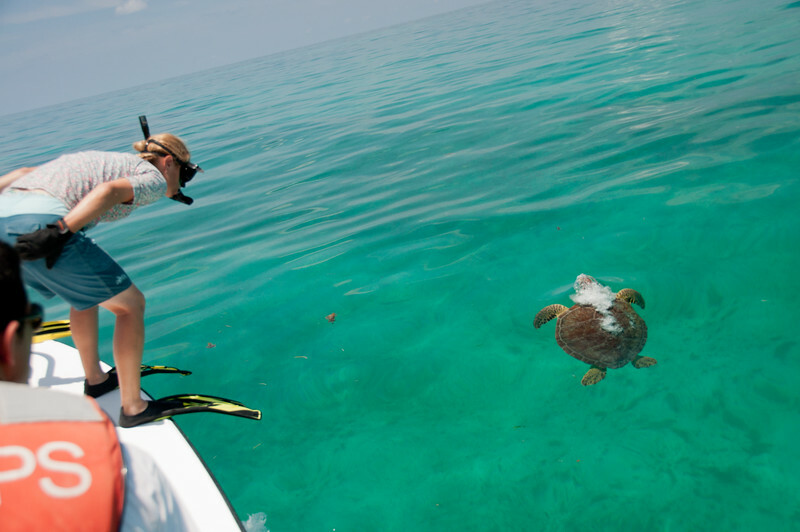 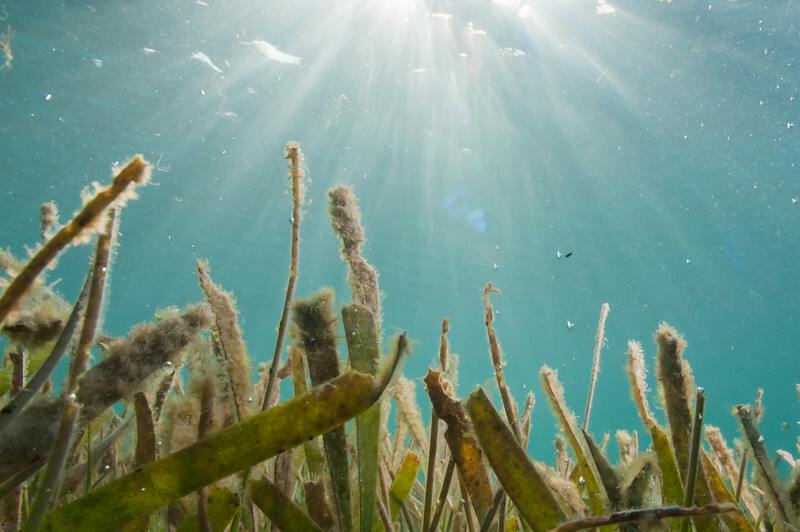 Calm, clear waters in the shallow foraging grounds of the Dry Tortugas make for perfect rodeo-capture conditions. 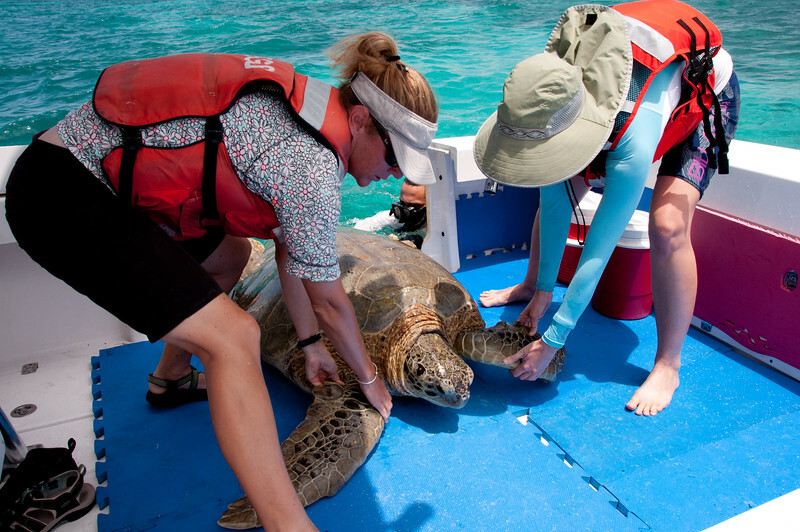 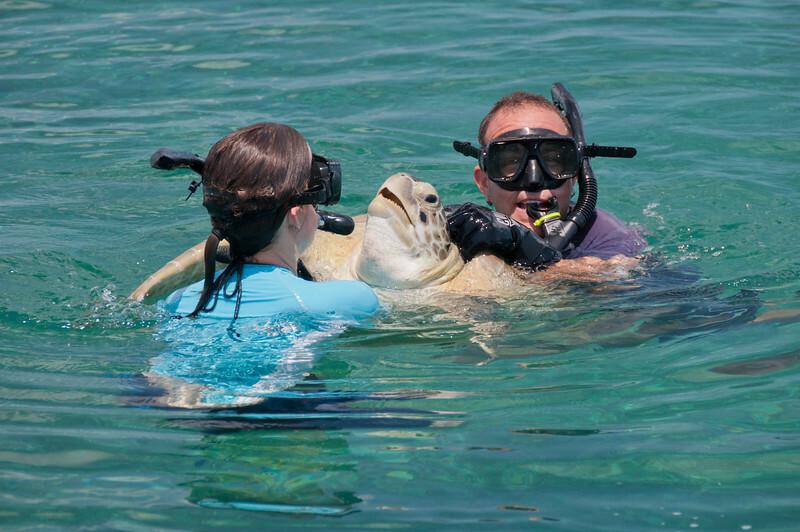 USGS biologists hold a captured turtle on the surface while the boat approaches to pick them up. 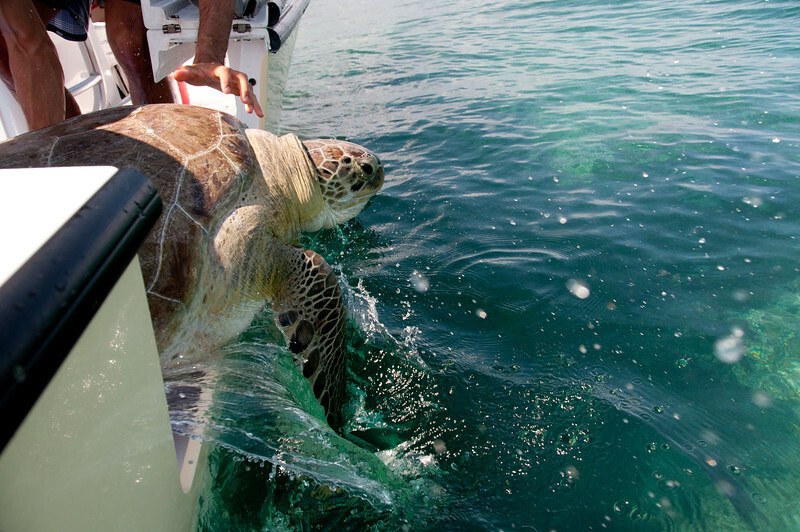 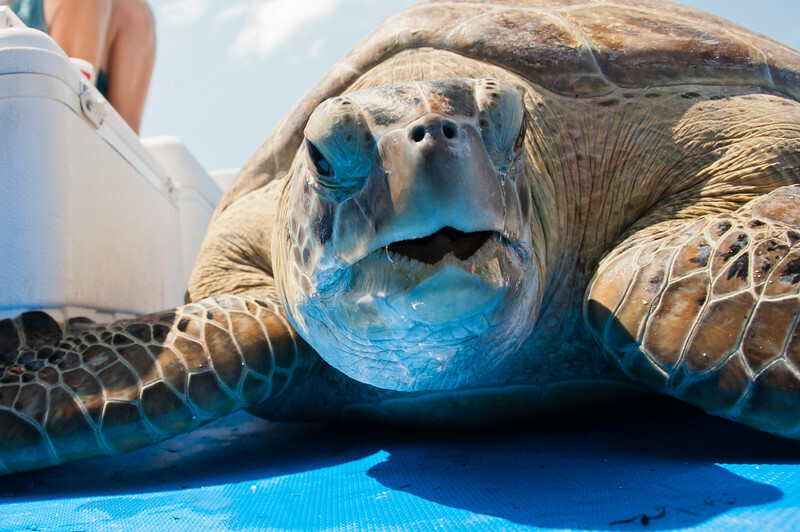 USGS biologists, working in partnership with NPS, haul an enormous rodeo-captured green turtle into their research boat. 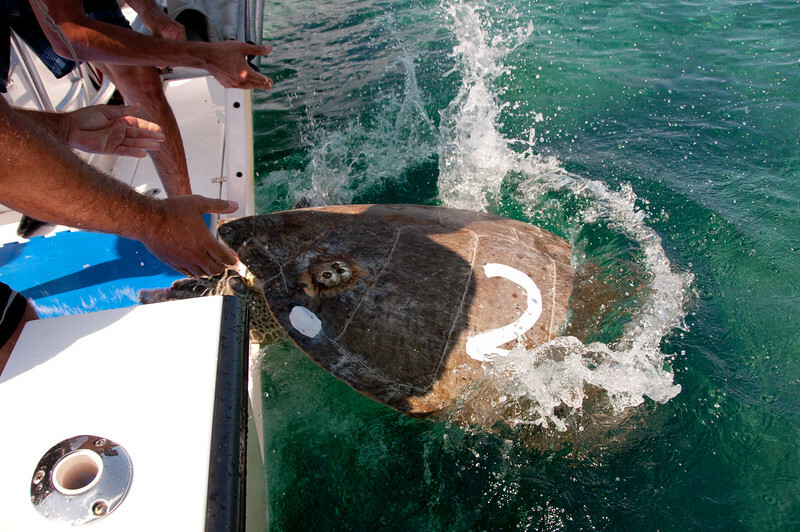 The turtle's shell is painted so the team doesn't accidentally recapture her in the near future. 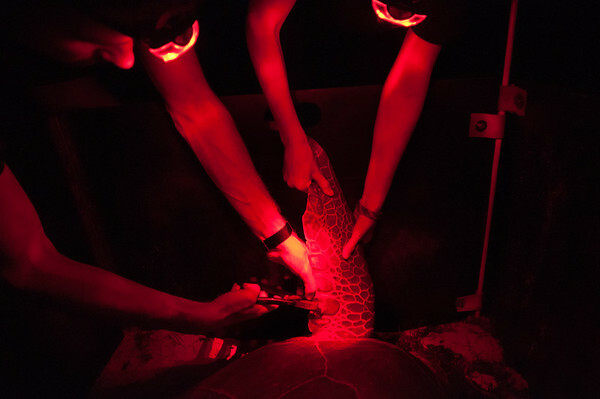 You can see the small acoustic tag on the back right side of her shell. 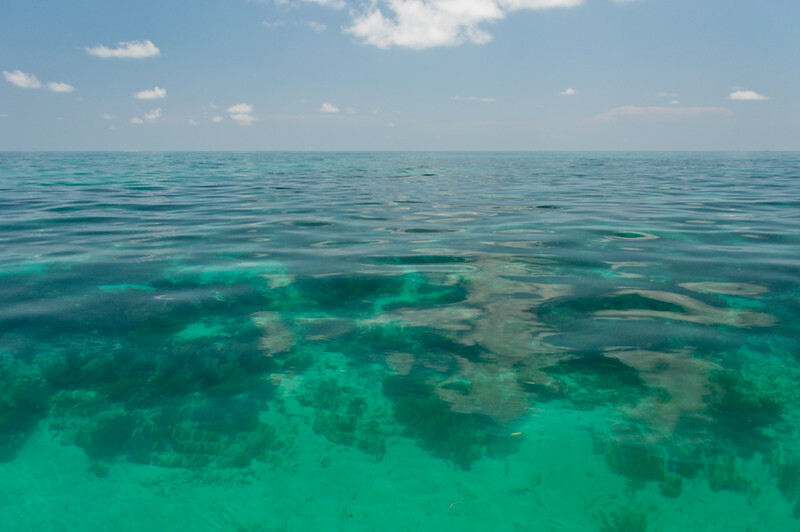 The dock at Loggerhead Key with the M.V. 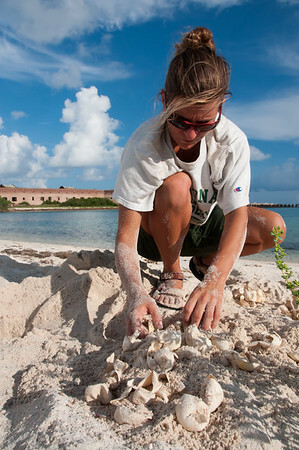 Fort Jefferson, and our bean-bag base camp for the evening while we waited for turtles to start coming up the beach to nest.